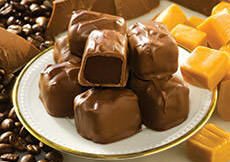 Chocolate-dipped caramels...with a sweet-n-salty twist! We've taken buttery kettle-cooked caramels, drenched them in the finest chocolate, then sprinkled the tops with a touch of sea salt for an unforgettable sweet and salty treat! 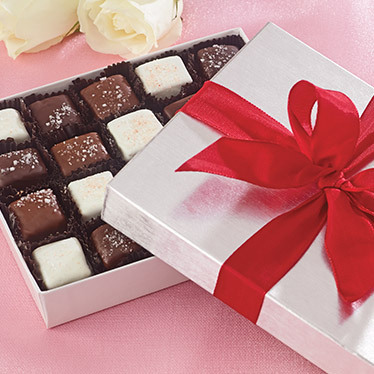 These tempting morsels include milk, dark, and white chocolate varieties lovingly hand-packed in a silver foil gift box tied with a red satin ribbon. 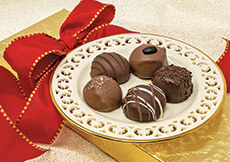 INGREDIENTS: milk chocolate [sugar, cocoa butter, milk, chocolate liquor, soy lecithin, vanilla, vanillin (an artificial flavor)], dark chocolate [chocolate liquor, sugar, cocoa butter, milk fat (butter), soy lecithin, vanilla], white pastel coating [sugar, partially hydrogenated palm kernel oil, whey, nonfat milk, mono and diglyceride and soy lecithin emulsifiers, artificial color (titanium dioxide), natural and artificial flavor], corn syrup, sugar, whipping cream, butter, soy lecithin, vanilla, salt.